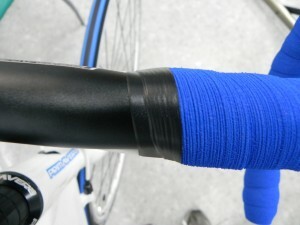 Although taping handlebars requires a good deal of skill, just about anyone can develop expertise quickly given enough practice. What makes it tricky is the variety of materials used. The key property is probably elasticity. Here are a few examples. 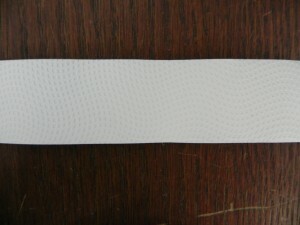 This type is one of the harder to wrap due to its low elasticity. It requires a lot of practice to wrap through the curves and not have the tape buckle and contort as each wrap-around overlaps the previous. Nevertheless it gives an extra air of elegance to any bike. This variety is the one that is most popular with customers by a long way. It is also the most easy to wrap due to its high elasticity. This variety is comfortable and wears well, although it’s closer to the first one in elasticity. 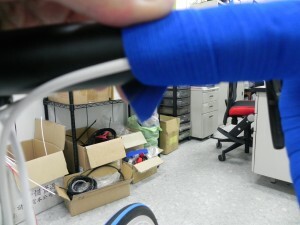 As for the art of wrapping itself, two parts in the whole process are most important: a) the wrap around the shifter b) the finish in which you secure the lose end of the tape, neatly, to the bar near the stem. It is this process of finishing off that is the focus of this post. Let’s pick it up right at the end where we need to secure the end of the tape. 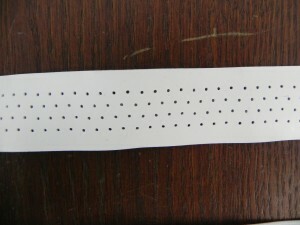 The tape being used in this sequence is the most commonly requested. 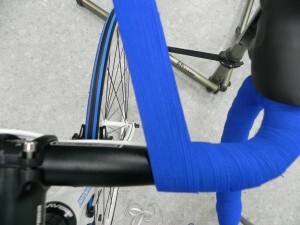 Blue is the chosen color since the bike’s color scheme is blue/white. A neat finish involves having no more than one width of black tape to hold the handlebar tape in position — this presents a neat transition from the tape to the bar. It’s a relatively straight-forward job with this variety of tape given the degree of elasticity. 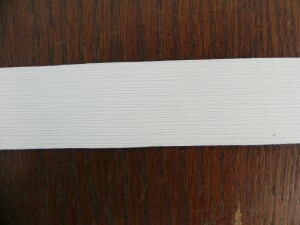 Here the tape is ready to be cut. It must be cut in the right place and in the right shape. This is so it will wrap around to the underside of the the handlebar where it will be first secured by the black adhesive tape. 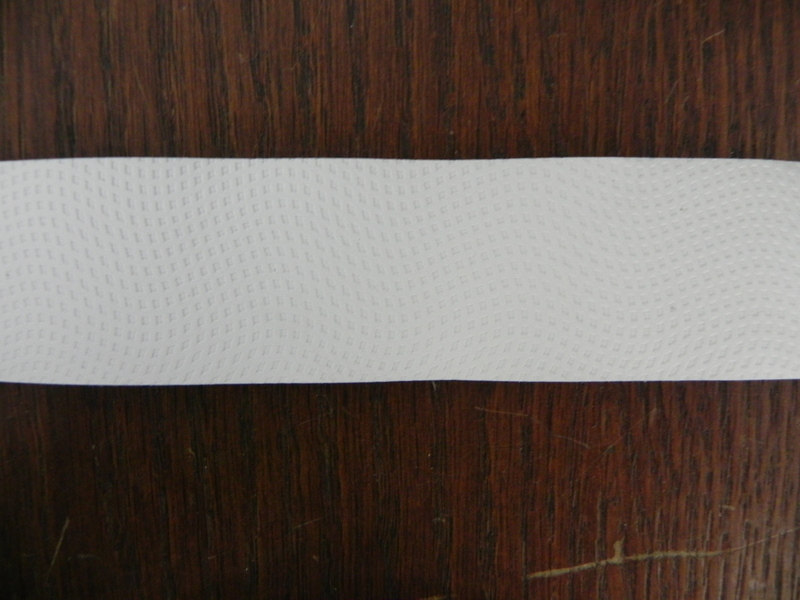 The top right corner (or angle of the scalene triangle formed by the cuts) should wrap around underneath and touch the left hand/ opposite side of the tape. 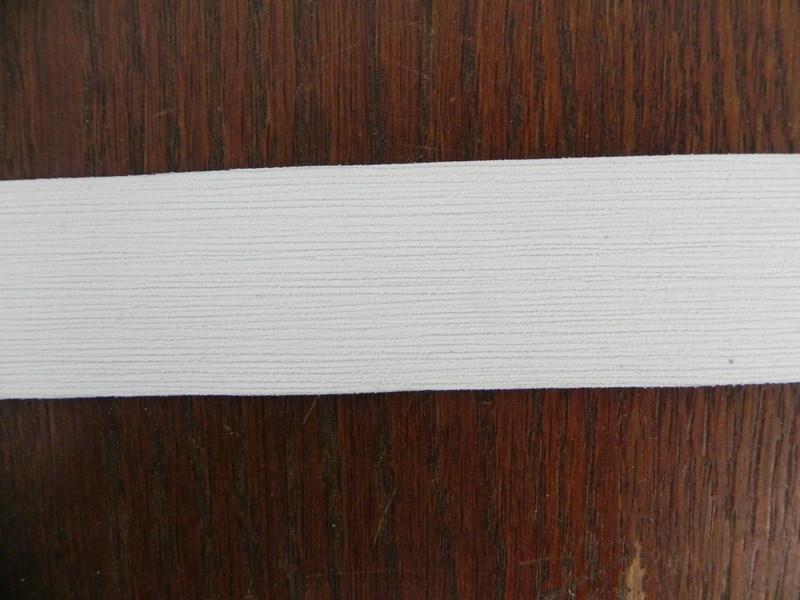 The tape is wrapped around to meet its opposite edge underneath. 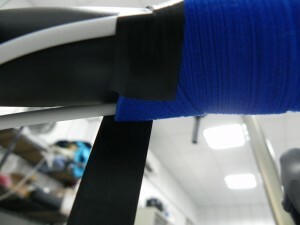 The narrow leading edge, facing the floor, is pulled back flush with the handelbar, meeting just behind the point where the cable housing exits the tape. 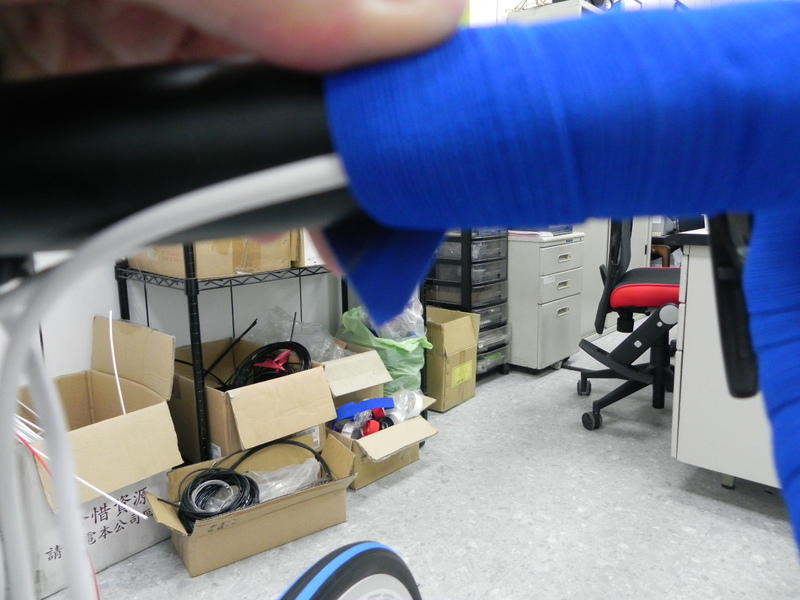 Next is the application of the adhesive tape to the underside, selecting the degree of transition overlap between tape and handlebar. Wrap around once, getting the correct position and then follow through to completion with another 2 full wrap-arounds. This will ensure that both the adhesive tape and the handlebar tape do not unravel. 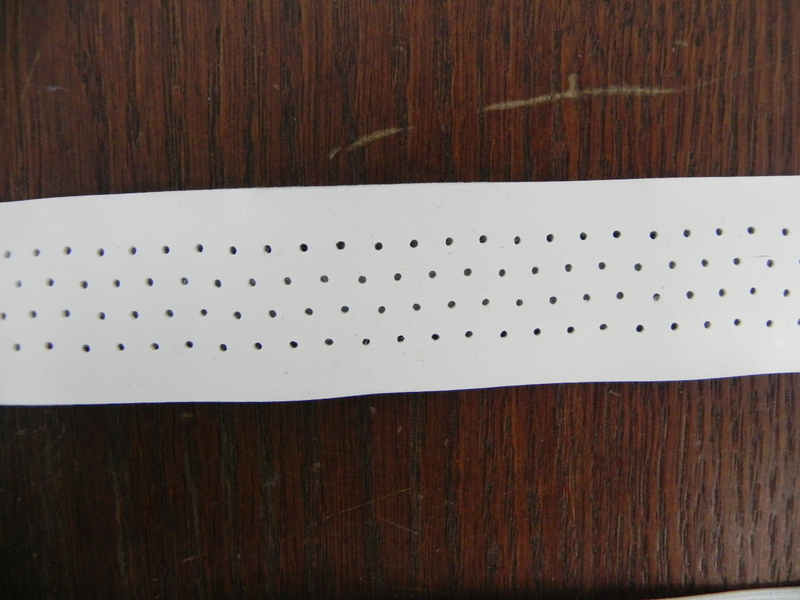 Cut the adhesive tape underneath and press it flat making sure all edges are firmly adhered to the layer underneath it. There you have it. That’s a wrap! 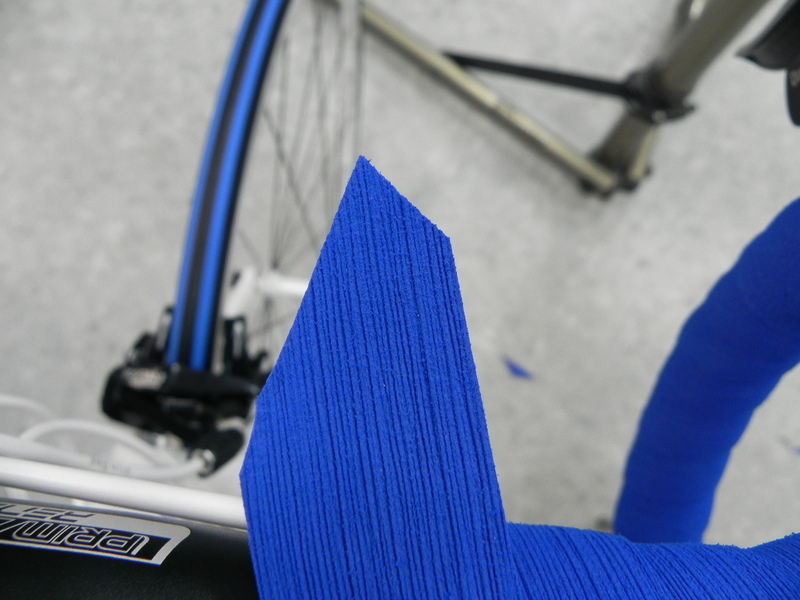 It’s one way to complete the process of wrapping handlebar tape neatly, ensuring a durable seal for as long as you retain the tape. Great article. I’ve re-wrapped my bar tape once and it took me a few tries to get the end right. Thanks Bryan. Seemed to be enough material online about wrapping bars but not so much about the end game…like just about everything else when it comes to bikes, the small differences or fine tolerances, the right cut here or there, makes all the difference.